Being a dog parent to an anxious dog is hard work and finding an over the counter anxiety medication that is effective for your pooch is even harder. With a wealth of experience in the treatment of an anxious dog today, I’m going to share my personal experience with a handful of popular dog anxiety medication over the counter options. You’ve heard me talk about my accident-prone black Labrador a time or two before. He was always an anxious, medical mess – the product of a puppy mill, but the most loyal dog you could ever hope to have and more. Dealing with his anxiety was difficult, though, and as he aged, it only got more so. At the start of our dog's anxiety symptoms, we resolved to work on Jet’s behavioral patterns. We had experienced various unpleasant reactions to routine medications already and I was determined to avoid them for as long as possible. It soon became apparent that Jet’s anxiety was really influencing his quality of life, so we talked with his vet about other solutions. We agreed to begin with over the counter dog anxiety medications, solutions and aids before prescription solutions to lessen the likelihood of unforeseen side effects. What Options Are Available to Treat Canine Anxiety? Your experience with canine anxiety may be similar to ours or it could be completely different, so what is best for your dog is not necessarily going to be what was best for us. I recommend talking with your veterinarian if you notice anxious behaviors in your dog and discussing which options may be best for their treatment. Behavioral modifications were our first port of call for most behaviorally related concerns we ran into with Jet. Behavioral modification is exactly what it sounds like – changing patterns of behavior so that the outcome of those behaviors is different. For example, Jet would become severely anxious when I left the house without him. So, I made a note of the things that would trigger him to become anxious – getting my keys, my coat, etc. I would then just keep my coat on or play with my keys without leaving the house. The idea was to desensitize Jet to the stimulus that kickstarted that anxiety. Once in a while, I would even go outside, close the door, and come back just a few minutes later with praise and treats in hand. With perseverance, this type of canine behavioral modification is usually quite effective. However, for Jet, his anxiety was so severe and his quality of life was so influenced that I soon decided that we needed to add in a second treatment option to allow us time enough to focus on behavioral modification. As I mentioned above, after talking with Jet’s vet, we decided to give over the counter anxiety solutions a try first and foremost because Jet had a history of being hypersensitive to just about every medication in the book. We chose over the counter medications because they are generally safer than prescription medications with less significant side effects. Think of this like trying Benadryl versus going to the doctor for a steroid injection. There are a variety of prescription medications available for canine anxiety, some of which have a lengthy history of use and others that are quite new on the market. These medications range from SSRI’s like Prozac to benzodiazepines like Xanax to a range of tranquilizers that do little more than knock your dog out so they aren’t conscious to feel symptoms of their anxiety. The SSRI type medications tend to take a while to build up in your dog’s system where Xanax and tranquilizers are more immediate, but all three medications influence your dog’s state of mind and behavior. Don’t get me wrong, there are times when these types of interventions are the best option for a dog, but for us – with a dog whose fur all fell out at the application of flea and tick preventative – they didn’t seem like the best second line of defense. In addition to behavioral interventions, over the counter medications, and prescription medications, there are other anxiety treatment aids available. Things like the Thunder Shirt or alternative anxiety vests, the Soothing heartbeat puppy, pheromone pads and calming collars, etc. We tried a few of these options when we sought a way to reduce Jet’s anxiety and I will include some of them in our dog anxiety medication over the counter list noted below because they were purchased over the counter as alternative treatment options and some proved to be quite useful. Below are some of the better over the counter anxiety medications that we tried for canine anxiety and our experiences with each. Shen Calmer was first recommended to us by a holistic veterinarian who had been recommending it for anxious pets for many years. Trusting his experience, we opted to give it a try too. 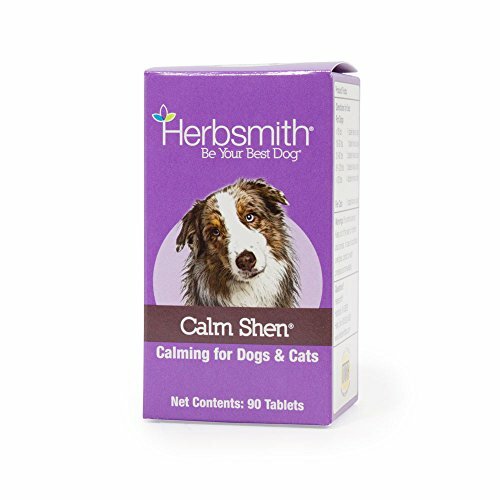 Shen Calmer is made from a blend of herbs that have been approved for use in cats and dogs. Although it’s not a particularly potent mixture of herbs, with regular use they build up in your pet’s system over time for a stronger effect. What we really liked about Shen Calmer is that the active ingredients are veterinary trusted by holistic veterinarians and herbalists around the world. The capsule and tablet formulas are also both easy to slip into your dog’s daily diet. What we loved best about the Shen Calmer, however, was that it had a calming effect on anxious behavior without the sedating effect that other more potent anxiety solutions have. While we found Shen Calmer to be beneficial when it came to taking the edge off (read: reducing symptoms but not eliminating them) in a severely anxious dog, there was one side effect that we could have lived without – GAS! We’re not talking about those cute little “toots”, we’re talking about full-blown toxic gas for a full 24 hours after taking. There are multiple versions of Shen Calmer or Calm Shen available and in our experience, they all seem to be equally as effective. I’d recommend trying Shen Calmer if you have an anxious dog who does not have a sensitive digestive system! Grizzly Organic Hemp Hip and Joint Health Mini Pellets for Dogs are a product that I came across by accident when shopping for our usual Grizzly Salmon Oil. We had been trusting Grizzly brand for years for Jet’s coat, skin, and joint supplementation, so it seemed a no-brainer to try their pellet formula with organic hemp. Grizzly organic Hemp Hip and Joint Health Mini Pellets for Dogs are marketed as a joint supplement, however, they are equally as effective as other Grizzly organic hemp products when it comes to anxiety, so for an older dog, they’re a great solution. Plus, if you’re like me and trying to cut down on the number of unnecessary chemicals in your home, you’ll love that this supplement has the NASC (National Animal Support Counsel) seal of quality which essentially means it’s a safely produced and trusted supplement. 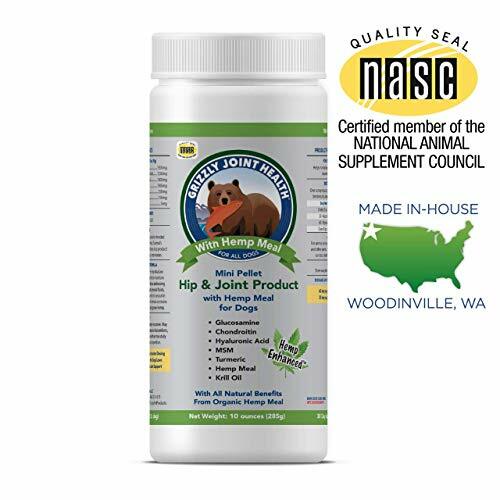 There are more than a few things that we loved about the Grizzly Joint Health supplement including the NASC certification. What made it especially appealing, though, was the fact that it addressed two problems at once so we could cut down on our daily supplements and the cost of those supplements while still making Jet feel comfortable. Best of all, though, is the simple fact that the product worked while being tiny enough to slip into food and not give Jet toxic gas as the Shen Calmer did! There are various similar products available that combine hemp with fish oils, however, these products are NOT all created equal and we have yet to find one that matches up to Grizzly brand. I’d recommend this anxiety solution for dogs with all degrees of anxiety, although, it’s particularly helpful for older dogs who are in need of joint support as well. 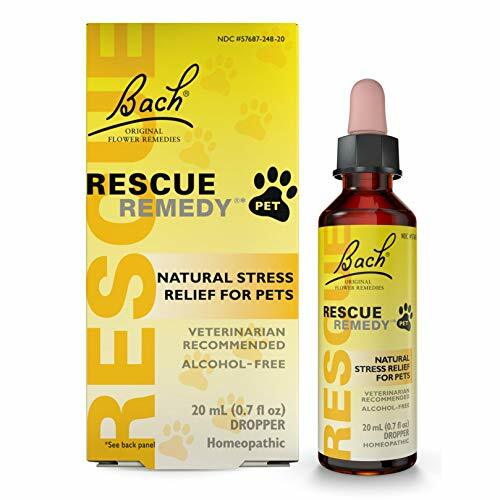 Bach Flower Rescue Remedy Natural Stress Reliever is a product I became familiar with through working with various rescue organizations. I had seen it work firsthand in dogs traveling with rescue convoys and had no reason to doubt that it would work for Jet too. The ingredients in Rescue Remedy drops are all natural (coming from flowers that are pet-safe) which is one of the things that I think appeals to most people about this anxiety solution. For us, it was particularly appealing because of Jet’s sensitivity to just about everything! To use Rescue Remedy, you can feed a few drops of the solution on your dog’s food, treats, or in their water, or you can rub the solution onto the tips of your dog’s ears. When we first used it, we opted for the ears (just in case of digestive issues!) When we got no results from using the formula on his ears, we tried applying the solution to treats. Fortunately, Jet had no digestive trouble after ingesting the drops but unfortunately, he also had no relief from his anxiety either. What I will say about Rescue Remedy is that if your dog has severe anxiety or separation anxiety, don’t pin all your hope on this formula being your saving grace; in fact, I’d recommend trying one of the other products instead. Pets Primal Hemp Oil for Dogs is a product that I ran across completely by accident while shopping online for other pet supplies. I had been wanting to give organic hemp oil drops a try since my parents had recommended them after using them in their rescue dog. 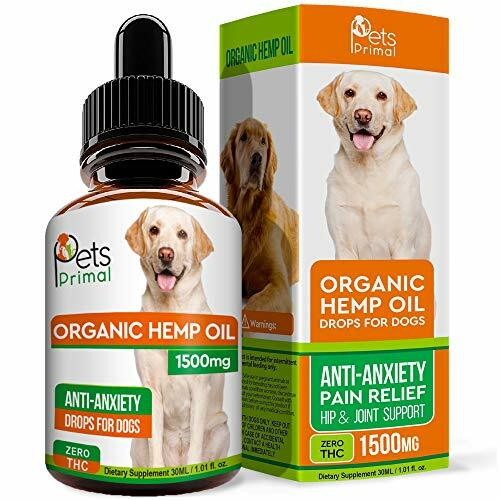 Pets Primal Hemp Oil for Dogs was one of the highest recommended hemp oil products and since it contained those healthy omega fatty acids, I opted for their brand. I will mention that the bottle does have a warning against overdose and accidental ingestion by children which is a little unnerving for a “natural” product, but based on the reviews of other pet parents, I set my worries aside and gave it a try. The oil comes with a dropper that makes dosing easy and overall, I noticed a surprising decrease in Jet’s physical symptoms of anxiety. He was pacing less, panting less, not trembling, he wasn’t wide-eyed…do not get me wrong, it wasn’t a miracle product, but the reduction in his symptoms was a good 60 to 70% and that was huge for us. We also saw a slight improvement in arthritis symptoms but not as significant as we saw with the Grizzly Hemp mini pellets. Like most of the anxiety relief products we tried, I can’t guarantee that your dog will get the same relief from symptoms as we did, but I can say that for a severely anxious dog, it significantly improved Jet’s symptoms and for my parents less anxious dog, Finn, it completely eliminated his nervous paw licking. I’d say that this is a crapshoot as far as how effective it will be for your dog, but in my experience, it is fairly consistent in reducing symptoms overall. ThunderShirt was one of the first anxiety-relief products I decided to try for Jet’s anxiety simply because it was one of the least invasive options available. 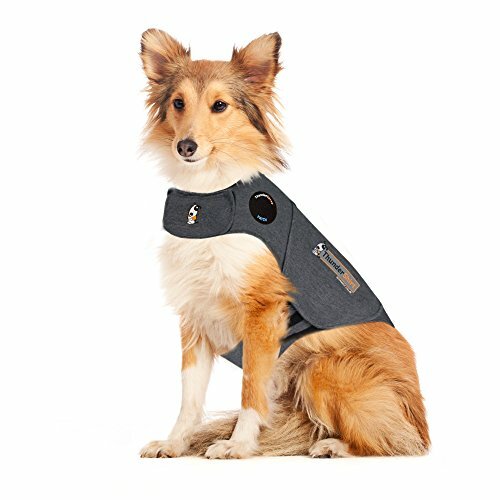 If you’ve been living under a rock and haven’t yet seen the ThunderShirt, it’s a wrap that fits around your dog like a shirt and adheres together with Velcro. It draws on the concept of swaddling to induce a feeling of calm – identical to the idea of swaddling babies. I had a lot of hope pinned on the idea of swaddling if I’m being honest. In the back of my mind, it seemed too easy of a solution, but I had seen other dogs thriving with their ThunderShirts on, so why not mine? The shirt itself was complicated to fit (don’t even ask what happened when I asked my husband to do it, suffice it to say that I never asked him to do it again!) and I worried that it was too tight or not tight enough every time that I fitted it on Jet. Even with those worries in mind, though, I was less worried than when we read over the side effect pamphlets for the various anxiety medications that were available. I’d really like to say that we had success with the ThunderShirt, but we did not. So, again, why am I still recommending it? Because I firmly believe that it can be effective for dogs with situational anxiety – noise phobias, nervousness in public, etc. So, if your dog falls on the milder end of the anxiety spectrum, I highly recommend trying the ThunderShirt before you go for the more invasive treatment options. Pet Naturals Calming Chews for Dogs was an impulse buy while I was shopping in one of our local boutique pet food stores. I asked the sales representative about them and while she could tell me that they were a natural option for dogs with anxiety, she hadn’t had experience with them herself. Always being on the hunt for effective anxiety solutions, I decided to give them a try anyway. The Pet Naturals chews are free of all the artificial junk you want to avoid, and they’re corn and wheat free which was another plus for my poor sensitive Labrador. Jet didn’t go nuts for the flavor of these, but he didn’t turn his nose up at them either although I put this down to his being spoiled with fresh meat treats, so other dogs may be less picky! 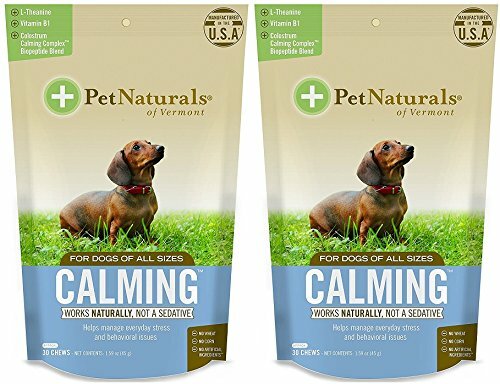 Overall, we found the Pet Naturals chews to be mildly effective for calming Jet’s anxiety, but not calming enough to compensate for the tummy upset Jet experienced. That said, I believe that if you are facing mild anxiety with your dog and they don’t have an unusually sensitive digestive system, you are more likely to get better results from these treats than we did. 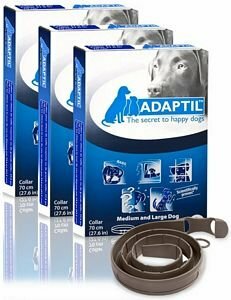 The Adaptil Calming Collar was suggested to me by a friend who happens to be a veterinary technician. At the time, we hadn’t found any product that was really effective for us but we were still trying to avoid medications, so we gave these a try. The collar is adjustable and small enough to go unnoticed if you have a dog who gets irritated with things like bandanas. The collar is coated with “dog appeasing pheromones” or pheromones that are naturally present in mother dogs that provide their puppies with a sense of wellbeing. Overall, I noticed a fairly significant reduction in Jet’s anxiety during the first day we used the collar. He was a much calmer dog overall and although he still showed signs of anxiety, he seemed more physically relaxed than he had been with various other anxiety solutions. While things were going quite well with the Adaptil collar for the first day, when the second day came, we ran into a snag. Jet, being a Labrador, LOVED water. I hadn’t given much thought to getting the collar wet at the time, but after a swim, I soon noticed the symptom improvement we had seen disappear. So keep in mind that if you use the Adaptil collar, you MUST take it off before your dog gets in the water! 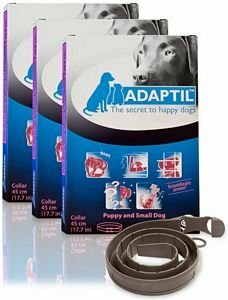 I found Adaptil to be a pretty impressive product for what it cost and if you have a dog who isn’t constantly on the search for somewhere to swim I highly recommend it for your nervous pup. The Snuggle Puppy was another product that I happened upon while shopping online for something or other. I had heard of the idea of using heartbeat sounds for calming babies and animals in the past, so the idea of a stuffed dog with a heartbeat seemed like a feasible way to reduce anxiety. At the time we purchased it, the Snuggle Puppy was quite pricey, but it has since come down in price making it a little more affordable for the average pet parent. The toy comes with a removable “heart” which creates a vibration when turned on inside the toy so that it feels like a real heartbeat and it also comes with a heating pad that you can heat up to replicate the warmth of a living dog. Please note: I didn’t have any qualms about investing in the Snuggle Puppy because Jet had always loved his stuffed toys, but if you have a dog who does not play well with stuffed animals, don’t even give this treatment option a chance because it was not built for durability and will not stand up to chewing! While we saw no relief of symptoms related to noise phobias and separation anxiety, I did find that the Snuggle Puppy was effective for Jet at night time with and without the heating pad. By the time we purchased it, Jet had begun to show symptoms of canine cognitive dysfunction, and the Snuggle Puppy was extremely effective in calming his nighttime anxiety so that he could sleep. I HIGHLY recommend the Snuggle Puppy if you have a young puppy with trouble sleeping or a senior dog with nighttime anxiety due to CCD. Warren London essential oil calming spray is a product that actually came out after Jet passed away, however, it used the same natural essential oils as we had used in an oil diffuser, so I wanted to include it in my recommendations because we did see results from these essential oils. The Warren London spray is an aromatherapy spray with lavender, sweet orange, vetiver, and clary sage and while the scent isn’t unpleasant, make sure you avoid being heavy-handed because it can be overwhelming if you go overboard. I used our essential oils blend I would set up our diffuser an hour or so before bedtime and diffuse the oils in the bedroom to create a relaxing scent. This spray does the same thing without the hassle of a diffuser, so you can just spritz the room before bed and be done. As far as the effects of these essential oils on anxiety, I can’t sing praises enough. While I never used the oils for symptom resolution at any other time, I can attest to their effectiveness on nighttime anxiety particularly when it results from CCD. Just the light scent of the oils was enough to relax Jet enough to lie still and fall asleep rather than do his anxious CCD routine of getting up and down repeatedly and having trouble falling asleep. 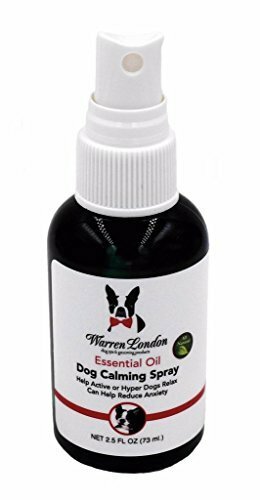 It could be that the Warren London aromatherapy spray is more effective than I can give it credit for, but I definitely recommend it for dog parents of seniors with doggy Alzheimer’s. Grizzly Organic Hemp Oil Calming Aid is another Grizzly brand product (have I mentioned how much I love their products yet?) with organic hemp. This oil is more focused on providing anxiety relief in comparison to the mini pellets which provides both anxiety relief and joint support. To be honest, we found the calming oil to have the same effect on Jet’s anxiety as the Grizzly pellets, but the pellets provided the added benefit of joint support, so we opted to stick with that option instead. 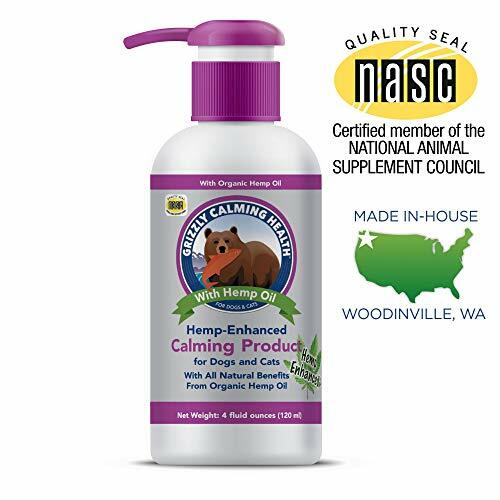 If you have a younger dog, however, and want to go for a cheaper anxiety relief option, the Grizzly Organic Hemp Oil is a comparable choice for $15 less. Of all of the over the counter anxiety medications and treatments that we tried with Jet, our favorite was the Grizzly Organic Hemp Hip and Joint Health Mini Pellets for Dogs. We liked this supplement best not only because it had the best effect over anxiety symptoms, but it also provided pain relief for Jet’s arthritis and hip dysplasia. The pain relief wasn’t such that we could eliminate pain control medications, but it certainly reduced our reliance on them. Whether your dog is experiencing existing joint concerns or whether they still have healthy joints, we still recommend giving Grizzly Organic Hemp Hip and Joint Health Mini Pellets for Dogs a try if your dog is fighting against anxiety symptoms. If you prefer, you can opt for the oil version of this treatment too (although the oil is recommended only for anxiety), but of the two, we found the mini pellets to be much easier to feed since we could be certain that the correct dosage had been swallowed. If you’re looking for an over the counter canine anxiety solution, we highly recommend looking into the full line of Grizzly Organic Hemp products but be sure to consult your veterinarian before you do!